An app that uses motion sensors built into most smartphones can interpret your mood from your body movements, say University of Oslo researchers. If you’re down, the app will play music to lift your spirits. If you’re happy, it plays music to keep you there. So basically, it just plays music. A digital archive of medical and health-related lectures for laymen and professionals recorded in the 1950s has been made available to the public by the NY Academy of Medicine and NY Public Radio. Highlights include talks featuring Leona Baumgartner, New York City’s first woman health commissioner; cancer pioneer Sidney Farber; American microbiologist and Pulitzer Prize-winning author René Dubos; acclaimed anthropologist and social critic Margaret Mead; Norbert Wiener, father of cybernetics; and discussion of the Freud Centenary and Lincoln’s doctors. Missing are all those cigarette commercials featuring doctors’ endorsements. Jailbreaking phones so you can do whatever you want with them is old news. Now you can jailbreak that fancy Keurig 2.0 coffeemaker so it will accept less expensive coffee pods made by third parties. Thanks to open-source coffee champion, Clark Howard! Already worried about winter heating bills? A German company called Cloud&Heat will give you heat for free. All you have to do is host some of its servers in your home or office. Google has signed a 60-year, $1.16 Billion lease on an aircraft hangar at Moffet AFB, just 3 miles from Google’s Mountain View HQ. Planetary Ventures, LLC, a Google subsidiary, will sink $200 million into renovating Hangar One for research and development of technologies related to "space and aviation, assembly and testing in the areas of space exploration, aviation, rover/robotics and other emerging technologies". Is Google Glass dying? Consumer sales of the $1,500 smart spectacles remain moribund. Used copies on eBay are going for half price. Nine out of 16 app developers surveyed have paused or abandoned Glass app projects for consumers; three more are working on business apps exclusively. Even Google co-founder and Glass development chief Sergey Brin left his Glass in a car when he attended a recent event. "Look the other way..." A hacker-proof fiber optic network featuring quantum encryption is being built in China. Quantum encryption writes bits of an encryption key on single photons which are transmitted via optics to authorized users. If a hacker even observes one of the photons it is disturbed, triggering an immediate replacement of the key. "It Wasn't Us!" China is suspected of hacking the U. S. Postal Service’s computer network and stealing the personal data of all 800,000 employees. U. S. officials theorize that China is just trying to build dossiers on government workers with a view towards counter-espionage and recruitment. In completely unrelated news, the Chinese government is kindly offering to sell Hacker-Proof Fiber Optic Network technology to the USPS. The WireLurker malware that shattered the myth that non-jailbroken iOS 7 and 8 devices cannot be infected was just the tip of the iceberg, according to new research. WireLurker is a relatively tame example of an exploit dubbed the “Masque Attack.” A malware app can be delivered to an iPhone or iPad via email or text. If the malware app has the same filename as an app already on the device, the malware will overwrite it and usurp all local data that the overwritten app has. Apple has been working on a fix since July, 2014. 3D printers lost every shred of their coolness on November 10 as Martha Stewart said she “loves” them. She also doomed HP’s new Sprout PC with her approval. Want an iPhone 6 that runs Android? Lenovo has blatantly copied much of the Apple product’s functionality and appearance in its new model S90 “Sisley” smartphone; even the screen’s wallpaper is virtually identical to the iPhone 6’s. Under the hood, the 5-inch, $330 Sisley has a quad-core Qualcomm processor, 1GB of RAM, 2,300mAh battery, a 13MP rear-facing camera, an 8MP front-facing camera, and ships with Android 4.4.4 KitKat. It’s available only in China, for now. The very first Web site created in the U. S. is browsable again at the Stanford Wayback archive. The home of the SLAC National Accelerator Laboratory as created on December 12, 1991, by physicist Paul Kuhn. Stanford Libraries is recovering and preserving other historic Web content at its Wayback site. Most recent comments on "Geekly Update - 19 November 2014"
Loved the piece on the health-related lectures. I found a picture much like those you posted re Camels. 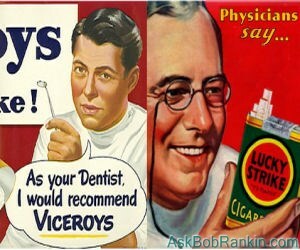 The ad stated "More Doctors Smoke CAMELS than any other cigarette! Amazing what we bought into wasn't it? Mr. Rankin. I thank you for Posting the link to the NY Medical-Related Digital Archives (of Lectures). I have a thing for all things 1950's so was actually Stoked when I learned of this! Mr. Rankin . . . Continue providing these very fine articles that you take time out of your personal schedule to produce. Gee. If I only had a Keurig coffee maker, I would have rejoiced at this article. Perhaps I should get rid of my reliable, hard-working 10 years old Toastmaster that cost less than 10 bucks. Life is always full of quandaries. Thanx, Bob, for bringing some light and clarity to our existence. Curse you Martha Stewart for your inevitable betrayal! As a person, with a strong medical background, the notation of the historical lectures of medical doctors, is of great interest to me. Some people will have some difficulty, understand what the doctors may be saying, due to medical terminology. However, I say, just go to a website that has a medical dictionary and it will help you. Personally, these lectures are "behind" the times, yet, in many, many ways "ahead" of the times. Most people do not realize, that much of a tried and true method, doesn't matter the age, is the best course of action, for doctors to take. So, for me, this was the best part of today's Geekly Update!!! Thank you, Bob, for finding this treasure. As for Martha Stewart ... Who, really cares, what she thinks or says??? However, I honestly, do not think, she has "jinxed" the 3D Printer. I have already read several articles, from my medical newsletters, how 3D Printers are doing wonders, not only for research, but, in the surgical field, itself! The last article, was about using a 3D Printer, to print out a duplicate "model" of a patient's abdomen, with all of the issues present, so that, the surgeons could "test" various ways, of getting at the tumors, without compromising the patient's life or lifestyle. Another article, was about using a 3D Printer, to duplicate a patient's heart, again, to "test" various ways to help the patient, with his or her heart disease, by means of surgery. For me, this is truly ... Landmark medicine, in the making. Hopefully, 3D Printing can lead to the creation of artificial organs, for implantation. I know, sounds like Science Fiction, but, I do believe that, anything is possible, when people look for different ways, to a common problem. Enjoy and rely on your non-geek-speak articles. How else would we keep up with what's going on in the cyber world! Didn't think the Snickers bar would travel well from Tasmania, so have just posted your link on my Facebook page. @MmeMoxie - You type the same way Christopher Walken talks. Very cool! @Jason --- Thank you, for the compliment. I honestly, write the way I think and talk. I also, do a lot of commenting, on Bob's articles. Now, there is one man, on a mission ... To educate, as many computer users, as possible. I am a BIG fan of Bob!! !